Holidays in Port Soller offer spectacular views and natural landscapes, with the Tramuntana Mountains behind the town and the golden horseshoe shaped sweep of sand to the front. It’s the ideal place for explorers, couples, and families, with its array of sights to explore by foot or bike, and restaurants, cafés, and bars all located within the town. Enjoy the serene atmosphere and traditional Majorcan feel of this little village, before heading off on boat trips, or land excursions for natural views and lively nearby towns. Spend your days on the golden sandy beach, which is backed by bars and restaurants where you can choose from traditional Majorcan fish paella or international favourites. Head out on boat trips to nearby towns or to simply enjoy the sparkling waters and their underwater wildlife. Or enjoy the many facilities available in the town’s hotels which offer amenities for adults and children, a choice of cuisines and more. Luxury holidays in Port Soller centre around the spectacular natural views offered by the town. Spend your days immersed in the tranquil feel of the town, spread out on the golden sands or speeding through the waves on a catamaran. Take to the mountains with hiking and mountain biking tours, or just wander through the pretty streets and enjoy a coffee or ice cream as you watch the world go by. At Sovereign we’ll take care of you from the moment you book with us to the moment you arrive home. We’ve hand picked all of the hotels we offer to ensure you can get the most from your time away, and will help you create memories to last a lifetime. 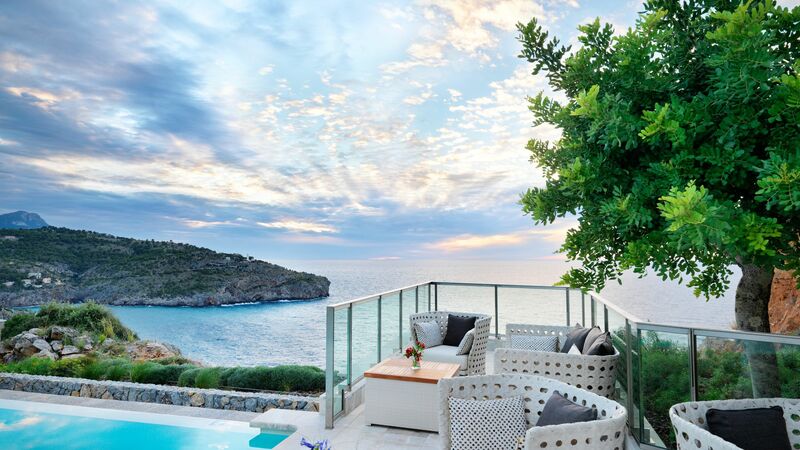 Stay at the Jumeirah Port Soller Hotel & Spa for a fantastic trip with everything at your fingertips. Take in the views of the beach from the bars, restaurants, and the infinity pool – enjoy sushi and Majorcan classics and relax in the spa while your little ones have fun in the Kids’ Club. The clementine trams of Soller (Tranvia de Soller) were the first electric trains in Majorca. Vitally, the track linked mountainside Soller to its fishing fleet in Port de Soller. Back in 1913, trams carted trailers of fish, oranges and coal alongside carriages of day trippers. These days, there’s fewer fish and more visitors. Most people get on at Port de Soller, switch to a vintage wooden train (Ferrocarril de Soller) at Soller, and travel on to Palma. With its well-marked footpaths and expansive Mediterranean views, the Tramuntana Mountains around Port Soller are made for walking. The easiest route wends its way up to Soller. Rustic paths pass chapels, myrtle forests, pirate watchtowers, thousand-year-old olive and orange groves, and sea-view villages. There’s also a route from Soller to the artists’ retreat of Deia – you can get there in four hours and catch a bus back. Transfer time from Palma airport to Port Soller is approximately 45 minutes.